I need some help. For a Christmas gift for my family, I am trying to take all of our home videos and converting them to DVD. I am using Roxio Creator 9 Home Version: 9.0.136 with a Dazzle DVC100 capture device. I have been using the Video Capture feature for over a month with no problems. 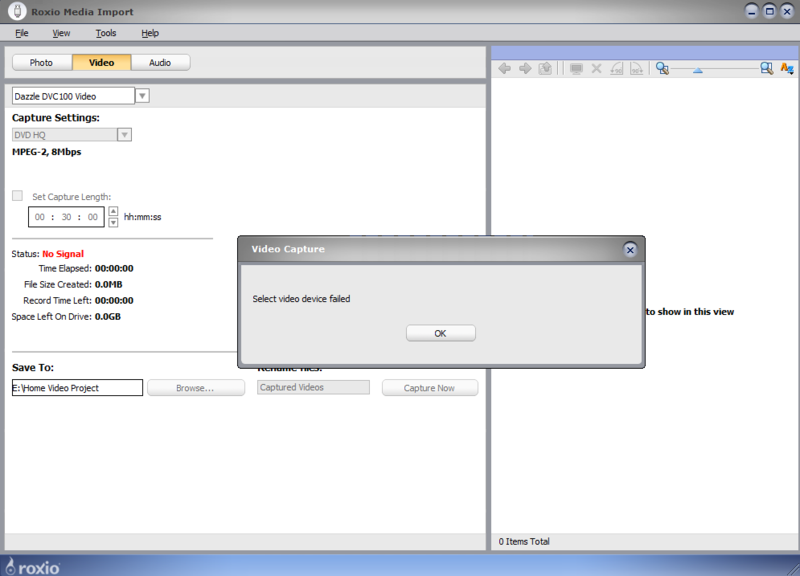 Now, all of a sudden, when I try to switch to the Dazzle, an error box opens saying "Select Video Device Failed." I can switch over to my webcam and it works fine. But the Dazzle does not. Plus, multiple times my computer shuts down after trying to switch to the capture device. Any help would be much appreciated. I know a little about computers, but as you can tell, not enough to fix this problem. p.s. - I have attached a screenshot of what happens.